1. Drumcliff. Detailed View of Cross Head. East Face. This sandstone Cross is situated at the edge of a graveyard a near the Protestant Church at Drumcliff. Its measurements are 3m high x 1.1m arms span, the shaft is 47 cm wide by 31 cm. It is mounted on a base 83 cm high x 1.23 m x 98 cm. The panels are not separated Harbison argues that the two parts of the cross were not originally designed for one another. (Harbison, 1992, p.70). 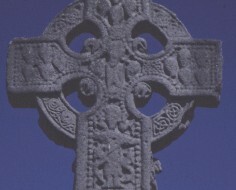 This is a close up view of the cross head of the east face of the cross at Drumcliff, Co. Sligo. There is a debate as to the precise representation here, see Harbison 1992, p.71. Suggestions include the Second Coming of Christ, The Last Judgement, Maiestas Domini, A bishop, Christ in Glory, and the Risen Christ.